LOS ANGELES (AP) — In less than two weeks, Southern California went from the depths of a coach’s firing to the heights of a wild celebration after beating the No. 3 team in the nation. Most of these Trojans have been on a roller coaster from the day they joined this storied but troubled program. This particular peak sent them soaring over mighty Utah. Cameron Smith returned the second of his three interceptions 54 yards for a touchdown and USC knocked the third-ranked Utes from the unbeaten ranks with a 42-24 victory Saturday night. Ronald Jones II, Justin Davis and fullback Soma Vainuku rushed for scores to help the Trojans (4-3, 2-2 Pac-12) snap their two-game skid and earn a victory for interim coach Clay Helton in his debut game at the Coliseum. Cody Kessler passed for 264 yards and a touchdown and rushed for another score, while JuJu Smith-Schuster had eight catches for 143 yards and a fourth-quarter TD that wrapped up the win. The sounds of the Trojans’ celebration could be heard through the walls of the Coliseum, where USC had lost its previous two home games. The Trojans were outstanding in their first appearance at the venerable arena since an embarrassing loss to Washington and the subsequent firing of coach Steve Sarkisian. After Helton took over for last week’s narrow loss at Notre Dame, he became the eighth straight USC coach to win his first home game when his Trojans dominated the Pac-12 South leaders. 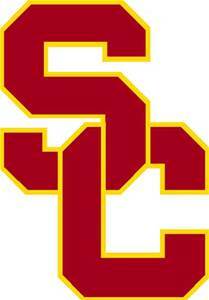 Smith, USC’s dynamic freshman linebacker, led a fine defensive performance by picking off Travis Wilson’s throws and making three returns for a combined 122 yards, including his scoring romp down the USC sideline 1:07 before halftime. Utah was second in the nation in turnover margin entering the game, forcing 19 turnovers and committing just seven. The Trojans erased that advantage thanks to Smith, the first USC player with three interceptions in a game since Jason Oliver in 1991 against Penn State. Britain Covey caught two touchdown passes for the Utes (6-1, 3-1), whose eight-game winning streak ended. While Wilson threw four interceptions during a rough night for the Orange County native, Utah also inexplicably failed to establish its running game against USC, which had been bullied up front this season. Star tailback Devontae Booker had just 14 carries for 62 yards, and Bubba Poole rushed for a score. The tumult-plagued Trojans entered the night as slight betting favorites against the powerful Utes, and USC proved Vegas’ prescience with an excellent game plan that largely played to its strengths. Jones and Davis combined for 139 yards rushing, and Smith led an aggressive defensive effort that limited Utah to 213 yards in the first three quarters. Smith returned his first interception 41 yards to set up Vainuku’s fourth-down TD dive. In the second quarter, Smith took his second interception to the house, putting the Trojans up 28-14. 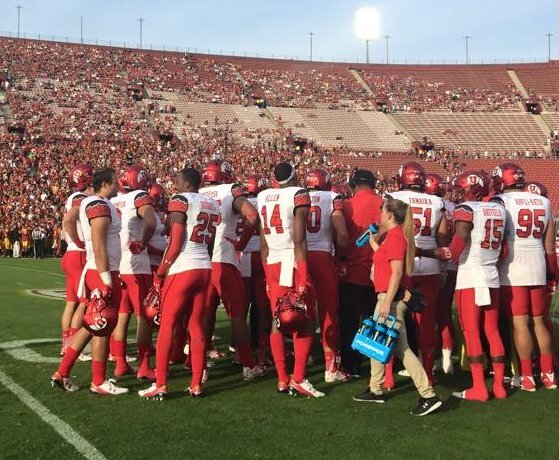 Utah played without top linebacker Jared Norris, Kessler’s best friend in their native Bakersfield, Calif.